The idea for Kling snow retention systems, as well as the registration of the utility model of the clamp for standing seam roofs, is due to the alpine situation. 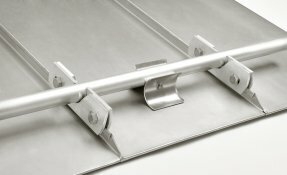 The first "snow retention system" for snow retention devices on metal roofs is available in the relevant specialist trade. In general, a distinction is made between a single and double tube system. tube and the smooth roof skin. Snow retention clamp for covings or riges max. 40° inclination. With V2A screws, for tubes with 32 mm Ø.